This paper explores the scale and composition of illicit financial flows from the 48 Least Developed Countries (LDCs). Illicit financial flows involve the cross-border transfer of the proceeds of corruption, trade in contraband goods, criminal activities and tax evasion. In recent years, considerable interest has arisen over the extent to which such flows may have a detrimental impact on development and governance in both developed and developing countries alike. This issue has been recognised by the UN as important for development and achievement of the Millennium Development Goals (MDGs). Illicit capital flight, where it occurs, is a major hindrance to the mobilisation of domestic resources for development. In many cases, it significantly reduces the volume of resources available for investment in the MDGs and productive capacities.Through the United Nations, the international community has committed to strengthen national and multilateral efforts to address it. As the deadline for achievement of the MDGs draws closer, it is vital understand more about the nature of this problem and to explore possible policy solutions, especially for those countries furthest off-track towards the MDGs. 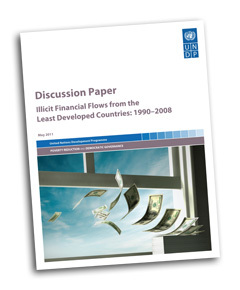 The study’s indicative results find that illicit financial flows from the LDCs have increased from US$9.7 billion in 1990 to US$26.3 billion in 2008 implying an inflation-adjusted rate of increase of 6.2 percent per annum. Conservative (lower-bound) estimates indicate that illicit flows have increased from US$7.9 billion in 1990 to US$20.2 billion in 2008. The top ten exporters of illicit capital account for 63 percent of total outflows from the LDCs while the top 20 account for nearly 83 percent. Trade mispricing accounts for the bulk (65-70 percent) of illicit outflows from the LDCs, and the propensity for mispricing has increased along with increasing external trade. Empirical research on illicit flows indicates that there are three types of factors driving illicit flows—macroeconomic, structural, and governance-related. The ratio of illicit outflows to Gross Domestic Product (GDP) averages about 4.8 percent but there is wide variation among LDCs. Of the top 10 countries with the highest illicit flows to GDP ratio, four are small island countries, two are landlocked, and four are neither. In some LDCs, losses through illicit capital flows outpace monies received in official development assistance (ODA). Estimating illicit flows from some LDCs is problematic because the underlying macroeconomic or partner-country trade data are either non-existent or spotty due to widespread on-going or recent conflict and/or weak statistical capacity. Complete macroeconomic and partner-country trade data were available for 34 LDCs, while 11 report partial data to the IMF and 3 are nonreporters.The report thus presents an estimate of illicit flows from some of the non-reporting and partially reporting countries based on the assumption that illicit flows from these countries are in the same proportion to GDP as are outflows from other reporting LDCs with complete data. The results of this study are indicative but demonstrate a clear need for further research in this area given the scale of the development challenges which currently face the Least Developed Countries and the need to ‘think outside the box’ and find innovative development solutions. The paper presents a number of useful measures LDCs may wish to consider to curtail the generation and transmission of illicit financial flows. The international community must also play its part. However, even where policy measures are well designed and targeted, lasting improvements in this area can only be achieved when there is the sufficient political will and leadership to tackle corruption and some of the root causes of illicit financial flows. For the Least Developed Countries, policy recommendations include measures to address trade mispricing through for instance systematic customs reform and the adoption of transfer pricing regulations with commensurate increase in enforcement capacity. The implementation of specialised software which helps governments to identify possible incidences of transfer pricing may also be useful to some governments. Measures to reform the tax base through the progressive strengthening and widening of the tax base in order to reduce dependence on indirect taxes which are more difficult to manage and have built-in incentives for tax evasion may also be beneficial. Ultimately tax is the most sustainable source of finance for development and the long-term goal of poor countries must be to replace foreign aid dependency with tax self-sufficiency. However taxation reform must be seen as equitable and fair and must not unduly burden the poorest. The international community must also support LDCs’ efforts to curtail the illicit outflow of capital. This includes specific measures to support LDCs to improve the systematic exchange of tax information between governments on non-resident individuals and corporations while the adoption of globally consistent regulations for transfer pricing could encourage multinational companies to modify their behaviour towards more transparency and accountability. The UN’s Model Income Tax Treaty refers to the importance of automatic exchange of information between national tax authorities in different jurisdictions. In order to stem tax avoidance by multinational corporations, the international community could support the development of an international accounting standard requiring that all multi-national corporations report sales, profits, and taxes paid in all jurisdictions in their audited annual reports and tax returns. UNDP stands ready to support LDCs and other developing countries in their efforts to curtail illicit financial flows in support of the MDGs. In particular, it can support countries to exchange practical information, experience and lessons learned on ways to tacklethis problem.